LRWC welcomes the government’s recent announcement of the release of 186 detained protesters. However, we note that hundreds remain in detention and news reports indicate that the National Intelligence and Security Service (NISS) continues to arrest and detain lawyers and human rights defenders in response to the ongoing protests. In particular, LRWC strongly condemns the reported arrests of Mr. Salahdeen Adam Alnour and Mr. Kamal El Jazuli. 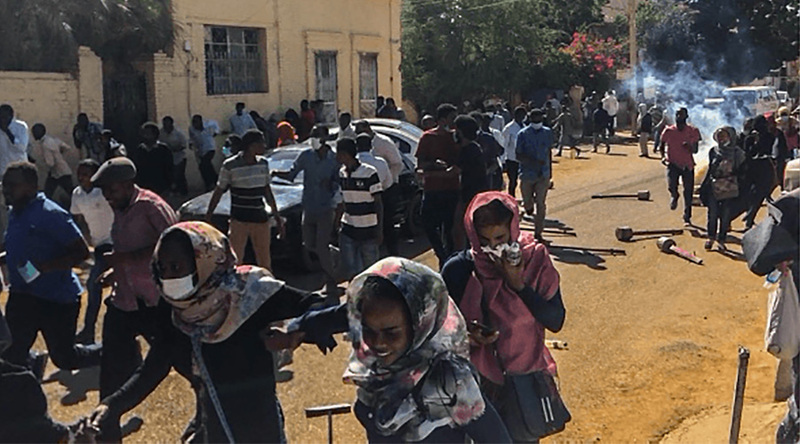 LRWC urges the Government of Sudan to immediately release all individuals who have been detained as punishment for their peaceful and legitimate human rights activities. I write on behalf of Lawyers Rights Watch Canada (LRWC), a committee of lawyers and human rights defenders who promote international human rights, the independence and security of human rights defenders, the integrity of legal systems and the rule of law globally, through advocacy, education, and legal research. LRWC has Special Consultative Status with the Economic and Social Council of the United Nations. I write further to our letter of 18 January 2019 in respect of the unlawful restriction on assembly and association in Sudan following the wave of protests which began in December 2018. LRWC welcomes the government’s recent announcement of the release of 186 detained protesters. However, we note that hundreds remain in detention and news reports indicate that the National Intelligence and Security Service (NISS) continues to arrest and detain lawyers and human rights defenders in response to the ongoing protests. In particular, LRWC strongly condemns the reported arrests of Mr. Salahdeen Adam Alnour in Nyala, South Darfur State on 28 January 2019, and Mr. Kamal El Jazuli from his office in Khartoum on 30 January 2019. On 31 January, a group of several dozen lawyers who were meeting to coordinate legal aid for detainees were also arrested. As a member of the United Nations and a State Party to the International Covenant on Civil and Political Rights (ICCPR) and the African Charter on Human and Peoples’ Rights (Banjul Charter), the government of Sudan has a legal responsibility to respect its peoples’ rights to peaceful assembly and association with others. We respectfully request the immediate and unconditional release of all individuals who have been detained as punishment for their peaceful and legitimate human rights activities and against whom there is no evidence to bring charges. LRWC also urges Sudanese authorities to guarantee their physical and psychological integrity and to respect their right to a fair trial, including unhindered access to their lawyers, doctors and families. Halt the deadly and excessive use of force and respect the right of people to peacefully voice their concerns and respond to grievances. Release detainees and put an end to all arbitrary restrictions of assemblies for peaceful protests and demonstrations. Carry out an immediate, thorough and impartial investigation into all reported killings, injuries and other abuses, and ensure justice for the victims. Conform with the provisions of the International Covenant on Civil and Political Rights and the African Charter on Human and Peoples’ Rights, ratified by Sudan, and particularly the provisions of each that guarantee the right to peaceful assembly and association. Your immediate attention to these important matters is requested.